The Colorado Department of Transportation (CDOT) and contractor, ABCO Contracting of Denver, will begin repairing 12 bridges at the I-25/I-76 and I-25/I-70 interchanges on April 14. This repair project is designed to improve the structural integrity of the bridges at two of the state’s busiest interstate interchanges, maximize driver safety, and upgrade the city’s infrastructure to support economic growth. The project entails performing bridge deck repairs, replacing expansion devices and roadway panels, repairing damaged bridge rails, and applying a polyester concrete overlay to 9 structures for added strength and stability. Construction to connect I-76 with I-25 began in late 1987. I-76 between I-25 and I-70 was built in conjunction with the reconstruction of the Mousetrap (I-25/I-70 interchange) from 1987 to 1993. Various segments, bridges, and improvements to the interchanges’ capacity and structure have been made since then to support population growth in the metro area. Bridge deck replacement and structural repair projects such as this one are vital to the metro area’s economic growth and safety of the traveling public. Repairs will be performed on twelve structures at various site locations from MP 005.62 to MP 274.011 on I-25 and I-76 (see image and table), and at one location on I-25 and I-70 in Adams and Denver County. CDOT will begin bridge repairs at twelve locations (see table) on Sunday, April 14. Work will be performed at night from 7:00 p.m. to 5:30 a.m. to minimize travel impacts. We apologize for any inconvenience this may cause, but repairs to the city's bridges are critical to meeting FHWA standards, supporting increased traffic demands, and maximizing driver and work crew safety. Work is scheduled to begin on Sunday, April 14, and completion is scheduled for October 2019. Work will be performed at night from 7:00 p.m. to 5:30 a.m. Sunday through Thursday. 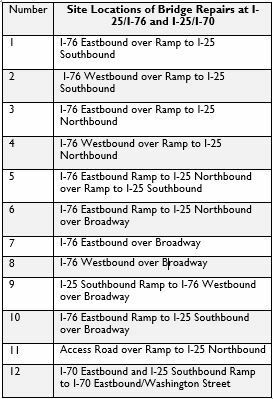 Full lane closures and resulting detours will be in place for bridges 5, 6, 10, 11 and 12 (see table) during working hours overnight. Lanes will reopen by 5:30 a.m.
Detour signage will be posted to safely guide motorists through the construction zone throughout the duration of the project. On and off-ramp lane closures, including shoulder closures are expected. Width restrictions of 12 feet will be imposed. Signs and automated signals will redirect traffic during construction activities. Speed limits will be reduced for driver and crew safety.